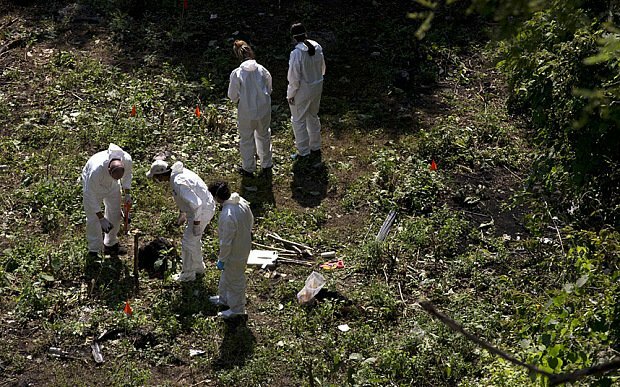 Mexican forensic experts have identified from charred remains at least one of 43 students who went missing in Guerrero state. A family member of one of the students, Alexander Mora, confirmed that the remains identified were his. The students were allegedly seized by local police in the town of Iguala in September and given to a criminal gang. Prosecutors say the gang killed them and burned their bodies at a rubbish dump near the town of Cocula before scattered their ashes in a river. The students’ disappearance has triggered widespread protests across Mexico against corruption and violence. Another demonstration was held on December 6 in Mexico City at which parents of students spoke about the identification. “If [the government] thinks that, because one of our boys’ DNA was identified, we will sit and cry, we want to tell them that they’re wrong,” Felipe de la Cruz, father of a missing student, told the crowd. The unrest has seen President Enrique Pena Nieto’s popularity rating drop to its lowest point since he took office two years ago. In response, Enrique Pena Nieto has submitted a package of reforms to Congress that include replacing all 1,800 municipal police forces with state-level units. The students had travelled from a teacher training college in Ayotzinapa to Iguala to protest against what they said were discriminatory employment practices for teachers which favor urban students over rural ones. Police opened fire on the students, who were in buses travelling back from Iguala to their college. Three of them were killed and three more people in nearby vehicles also died. A busload of the students tried to flee but was chased by municipal officers who then took them to the local police station. Some of the officers, who have since been arrested, told investigators they then handed the students over to a drug gang called Guerreros Unidos (United Warriors). Iguala Mayor Jose Luis Abarca and his wife, Maria de los Angeles Pineda were arrested in the beginning of November in Mexico City. Mexican officials accused Jose Luis Abarca of ordering police to confront the students to prevent them from disrupting a public speech given by his wife. More than 70 other people have been arrested in connection with the disappearances.